IceSL-forge is the most complete and powerful software. It combines modeling and slicing and gives unprecedented flexibility for modeling and fabricating complex, customizable shapes. 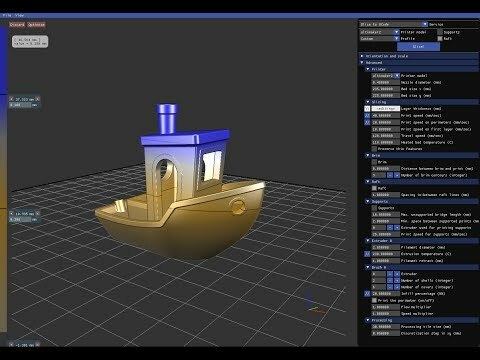 Modeling is done through scripting with a Lua-based language that allows to describe boolean combinations of shapes (triangle meshes, voxels, implicit surfaces, shaders). Thanks to state of the art rendering technology, all operations are performed interactively with real-time feedback (see it in action), allowing interactive customization of model parameters (live customization examples). The same technology enables efficient slicing and generation of printer instructions (e.g. G-code), avoiding the expensive step of producing a mesh. Nothing stands between your model and your printer! IceSL-slicer focuses on slicing. Given a 3D model (e.g. STL), it will use our slicing technology to generate instructions for your printer (G-code, but also images for DLP printers and cutting paths for laser cutters). IceSL was added by dariuszkoryto in Jul 2018 and the latest update was made in Jul 2018. The list of alternatives was updated Jul 2018 There is a history of all activites on IceSL in our Activity Log. It's possible to update the information on IceSL or report it as discontinued, duplicated or spam. Maybe you want to be the first to submit a comment about IceSL? Just click the button up to your right!